The Darrang district, which has failed to get significant support from any Public Sector Undertakings (PSUs) under the Corporate Social Responsibility (CSR) programmes over the years, it has now managed to draw attention of the Indian Oil Corporation Ltd (IOCL) following the Central Government’s instructions. The instructions from the central Government came after Darrang along with six other districts of the State had been declared as “Aspirational districts” requiring support for infrastructural developments especially in the health , education , drinking water and sanitation sectors. As part of this initiative, the Guwahati Refinery of IOCL for the first time has come forward to provide fund for construction of 20 school toilet blocks with drinking water facility and construction of a maternity ward in Garukhuti Mini Primary Health Centre under Sipajhar LAC. In addition to these infrastructure development, the PSU under its CSR has also distributed two garbage disposal vans – one each for two civic bodies of the district – besides few garbage bins involving a total fund just over Rs 70 lakh. In this connection, a public inaugural function was organized by the Darrang district administration at the district library auditorium, Mangaldai on Sunday afternoon where Mangaldai Lok Sabha MP Ramen Deka was present as the Chief Guest. Addressing a gathering of several hundred people including teachers, Government officials, students, media persons, MP Deka described how the northern part of the State including Darrang have been lagging behind in development and the PSUs have also been ignoring these areas. He further stated that it’s only because of the intervention of Prime Minister Narendra Modi following discussion with a delegation of a parliamentary committee including himself that the IOCL has come forward to undertake CSR programmes in Darrang which has already been declared as an ‘Aspirational district’ with special focus of the district’s overall development. “It’s the outcome of the discussion of a few parliamentarians including me with the Prime Minister where development of the aspirational districts through CSR programmes of the PSUs found place,” MP Deka said. He also hinted at bringing more such CSR programmes to Darrang and Udalguri from other PSUs operating in the State. The objective was explained by Deputy Commissioner, Darrang, Ashok Kr Barman. The programme was addressed by Jogen Barpujari, Executive Director (Guwahati Refinery), MLAs from Mangaldai and Sipajhar Gurujyoti Das and Binanda Kr Saikia respectively, chairman of Mangaldai Municipal Board Pratap Bordoloi and ADC Narnarayan Nath among others. An MoU was also signed between IOCL and the Darrang district administration. 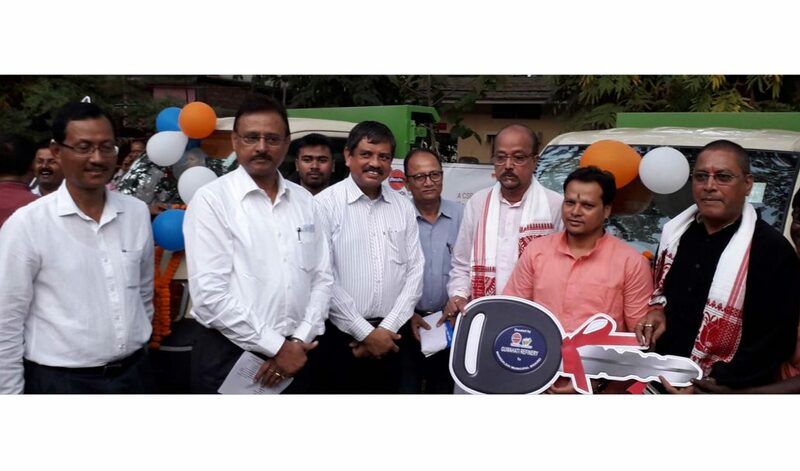 Later Chief Guest Ramen Deka handed over the keys of the vans to the chairpersons of Mangaldai Municipal Board and Kharupetia Town Committee .